For the first time ever, the Indonesian junior team made it to the final round of Badminton Asia Junior Championship’s mixed team event. Unfortunately, and despite playing at home, they couldn’t take the advantage as Korea took the top step of the podium. Indonesia, represented by Rinov Rivaldy / Siti Fadia Silva Ramadhanti (pictured right), started the final round by taking the first point for the hosts by beating Korean pair Na Sung Seung / Seong Ah Yeong in a tight game 21-19, 18-21, 23-21. Rivaldy/Ramadhanti had previous experience in deciders, as in the group stage against Taipei, where they took Indonesia to the top of the table. “We felt nervous at the first but we tried to play with nothing to lose. We believe in each other and did our best,” Rivaldy told after the match. 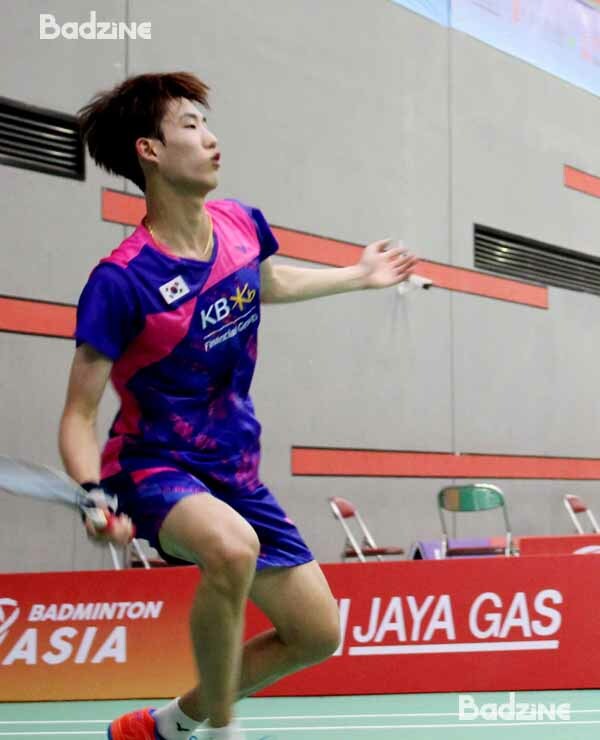 In the second match, Korea boys’ singles Woo Seung Hoon (pictured below) equalised against Ikhsan Leonardo Imanuel Rumbay, with the score 22-24 21-10 21-8 in 80 minutes. “In the first game, I tried to play fast because I still have more energy. Then I changed the strategy to play a little bit carefully in the second game but it ended up controlled by the opponent,” Rumbay explained about his performance. 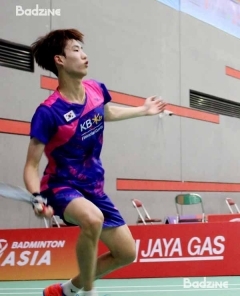 Indonesia opened up their chance to win their first ever Asia Junior Championship when Muhammad Shohibul Fikri /Adnan Maulana’s beat Kang Min Hyuk / Kim Moon Jun to take a 2-1 lead over Korea. 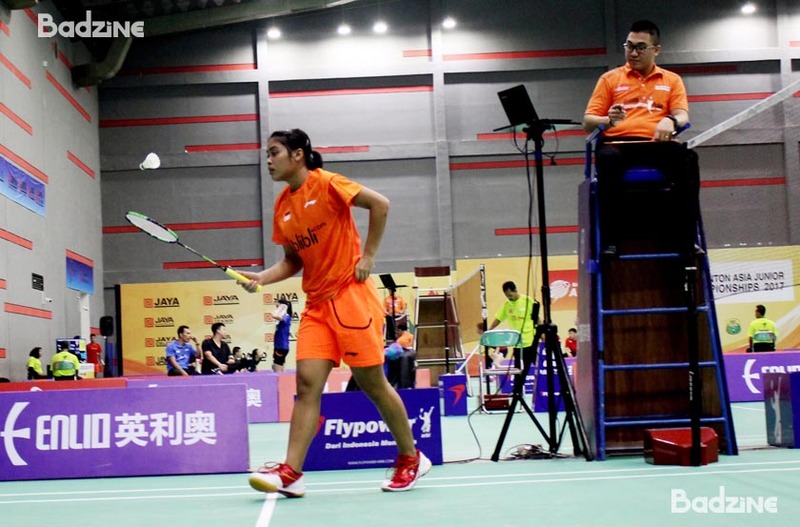 Gregoria Mariska Tunjung (pictured below), in her third Asia Junior Championship appearance, missed the opportunity to bring her team the win. Tunjung had to play a deciding rubber game after losing the first 19-21 but fighting back 21-7 in the second. “Gregoria should have won in two straight games. She was not into her game and following her opponent strategy in the first. The point gap was too big. She was trying to catch up but it stopped at 19,” said Minarti Timur, Tunjung’s coach. The 2016 runner up at the Asia Junior Championship led the match 19-17 in the third game but the opponent An Se Young equalised by 19-19. Tunjung got to match and tournament point first but missed, losing momentum, three consecutive points and the game. Minarti also told that alertness of both players was determinant of winning point. At point 20 in the last game, Tunjung didn’t expect that her strike could be returned by An, it turned out to be anti-climax of her performance. The fifth match took place, and the Koreans didn’t waste their chance to bring home the title. Kim Min Ji / Lee Yu Rim finished the match against Agatha Imanuela / Siti Fadia Silva Ramadhanti by 21-19 21-13 in less than an hour. “Today’s matches were very important. They was really close matches and all were difficult for us. Some players win, some lose, but in a team event, we win and lose together. We are lucky enough to win at this event,” said head coach of Korea junior team, Kim Hak Kyun. Mathilde has been a Badzine Correspondent since 2013. She is currently living in Jakarta and is working for a financial advisory firm. She also spends her time writing about badminton and helps local badminton communities to organize events related to badminton.